If you’re seeking a truly professional karaoke machine setup, take a look at the Pyle-Pro PWMA930I. This is one of the most feature-rich, all-inclusive karaoke setups I’ve had the pleasure of playing around with. As a bonus, it doubles as a wireless, two-way PA system. It’s tailor-made for bars, large parties, family reunions, and other sizable gatherings. It does come with one microphone (always a plus), and this specific model works up to 100 feet away from the Karaoke receiver! The unit comes with a built in dock so you can hook up your iPod and instantly blast whatever tunes you feel like. Speaking of blasting tunes, the integrated speaker is a whopping 8 inches – volume won’t be an issue for the beast of a karaoke machine. Let’s take a closer look at what the PWMA930I can do for you and your karaoke needs! 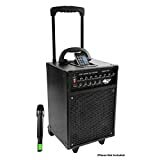 This thing is really more of an AMP on wheels than a karaoke setup, which I think is just fantastic. It sits on rotating, castor wheels, and comes with an extendable handle so you can move it around the room with ease. It’s important that professional setups have this sort of portability built in, because you never know when you’ll have to reposition your machine to avoid damage or improve the sound quality in a crowded room. As for controls, the Pyle-Pro karaoke machine has them all. Literally. You’re working with individual bass and treble controls, echo modulation, and just about every other audio manipulation option out there. I honestly had a grand old time fiddling with the knobs and buttons before I even started singing. Let’s talk audio input: This pro setup can handle audio from CDs, MP3 players, iPods, guitars and other instruments, other external audio devices, and pretty much any other source out there. Bonus – your MP3 players and iPods charge while hooked up to the PWMA930I! Like I mentioned before, the Pyle-Pro is technically a portable speaker and PA system. Having at least one of these is an absolute must for any bar, large gathering, or DJ serious about his audio. This setup can handle literally any and all of your audio needs. You can turn it into a powerhouse karaoke setup, use it to play music normally, use it as an AMP for a band, or hook it up to a TV to improve your audio. It’s important to note that the one shortcoming of the Pyle-Pro is it’s video capability – you can’t stream video or images directly from this unit. However, you can get around this by using a portable DVD player as an intermediary between the PWMA930I and a screen if necessary! For power, the unit makes use of an internal, rechargeable battery pack. This is fantastic, as you can unplug it from the wall and wheel it around without turning it off! IT does have four LEDs that let you know when the power is on, when the system is charging, when the battery is low, and when the wireless mic is connected and functioning. Last but not least, the Pyle-Pro comes with one VHF, FCC-certified wireless microphone. The PWMA930I setup is both portable and not portable – let me explain. The whole thing weighs around 25 pounds, and measures 21 x 13 x 13 inches. That’s not super light or especially small, so it will be a bit of a hassle to lug this thing around on the road from location to location. However, once you do get it wherever you’re going, it’s incredibly easy to extend the handle and wheel the whole thing wherever you want to put it. Even my 6 year old nephew was having fun tugging this thing around behind him. I will say that the wireless mic is a nice touch. It ensures you don’t have to constantly reposition the system, and lets people really have some fun jumping and running around mid-performance without worrying about tripping over or unplugging the mic cord. The Pyle-Pro PWMA930I really shines here. As far as I can tell, this thing is an absolute tank. It’s one of those battle-beaten AMPs that you see at every dive bar in the country – they may be grimy and beat to hell, but they do exactly what you want them to do without complaint for years and years and years. This is the type of setup you can knock around without fear. That’s what makes it such a good choice for venue owners. It’s so easy for unruly patrons to accidentally trash your equipment, so it’s best to invest in something like the Pyle-Pro that’s sturdy and resistant to getting knocked about a little bit. This thing is the definition of versatile. It does whatever you need it to do. In minutes you can transform it from the ultimate karaoke machine to the lead AMP for a band, and back again right afterward. From a purely karaoke standpoint however, it does have its limitations. You can very easily play karaoke CD tracks through the speaker, but you’ll have to tweak the setup a bit if you want lyrics up on a TV or screen. The PWMA930I is a jack of all trades – it can really cover all of your audio needs at once, even though there might be individual, more expensive and specialized components you could cobble together that may perform a bit better in their respective areas. The value of this unit really is insane, though. It provides extensive functionality for a fraction of the price you would have to pay if you went the individual component route I just mentioned. It does come with a dock for MP3 players and iPods, but this dock doesn’t fit iPhones, iPod touches, or other smart phones. However, you can get around this by using the 3.5mm hookup instead – crisis averted! There is no screen and you can’t stream lyrics/graphics/videos directly from this unit – like I said, you’ll have to go an extra step if you want to get lyrics up on a screen for karaoke. I personally didn’t experience this, but several other reviewers have mentioned a “hissing” sound when the unit is operating at high volume but without consistent audio playing. As far as I can tell this is just standard audio feedback, and you’d be hard pressed to find a unit that eliminates it completely. You can’t hear the noise when music is playing though, so it’s really a negligible con. If you’re a venue owner looking for a one-size-fits-all solution to your audio problems and needs, this unit is an excellent choice. You can re-purpose it as you see fit, wheeling it from one corner of your venue to the opposite with ease and as needed. Every bar and convention center needs a solid PA system, and this one has you covered at a very affordable price point. The Pyle-Pro PWMA930I is also a fantastic pick-up for full-service Djs, professional karaoke providers, and anyone else who needs a reliable, high-quality audio setup as a part of their business. Home owners and casual karaoke enthusiasts as well can get some solid use out of this – you might just end up replacing your home audio system with this all-in-one box!